Kim’s arguments for representation of masculine identity in Korean cinema before this point are brilliant and insightful but I would argue that they do not stop at the dawn of the most popular era of Korean cinema. The male characters constructed by New Wave auteurs such as Park Kwang-su, Lee Chang-dong, Jang Sung-woo and Hong Sang-soo still exist in the more generic Korean cinema of today. I will try and demonstrate this through a detailed examination of Bong Jong-Ho’s 2003 masterpiece Memories of Murder (hereby Memories), which, while ostensibly a film about the chase for an elusive serial killer in a provincial town in northern South Korea, is in fact a revisionist exploration of a post-traumatic and confused South Korean society which is attempting to come to terms with its scarred national identity but ultimately fails to do so due to its stunted cultural and political growth. However, Memories, which was an enormous box office hit in Korea, is in fact a hugely effective thriller which affectionately engages with all of the codes and tropes associated with its genre. Since 1999, the South Korean film industry has positioned itself in a more commercial direction and has subsequently become one of the most successful industries in the world and one of the only ones to best Hollywood domestically. To dismiss its social relevance on this basis however, would be a mistake. Within the limitations of genre and tried and tested formula, contemporary South Korean films have had an equally articulate social agenda and with higher production values and attendance rates they have arguably been more successful in conveying their ideas to Korean and international audiences than previous art house fare that may have never found an audience beyond the festival circuit. 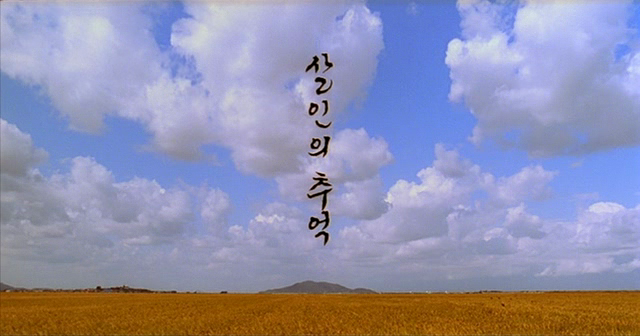 From Joint Security Area (Park, 2000) to The Host (Bong, 2006), South Korean films that have successfully engaged with social issues have consistently broken records and topped the domestic box office. Memories opens by stating that the following events are based on a true story in a time set under a military dictatorship. This information is key to understanding Bong’s motives, the fact that the story happens in 1986, in a difficult period of South Korea’s history, informs almost all of the narrative at an implicit level. Camouflaged under the guise of formulaic genre, there lies an extraordinarily dense sociological narrative. Before the first shot, we hear the wind and bustle of a field. As the image fades in, we see a young boy crouched in the field examining a lone cricket before snatching it. Then we hear a tractor coming from the distance, the young boy also does, so he gets up and the camera moves up with him. At this point, when we see the golden wheat field in the summer eve, a nostalgic melody seeps into the soundtrack. The boy walks out onto the dirt trail where down the road he sees the tractor and some children playing beside it in a burnt out car. As the tractor passes them, they follow it and jeer its driver with taunts of “Junk car!”, all the while the music and beautiful cinematography evoke a heavy and heady nostalgia. Next we see that a man is riding in the back of the tractor. He is middle-aged, a little chubby and he is smoking a cigarette, he tries to shoo the children away but this only inspires more raucousness on their part, so he taunts them back with hand gestures. As the tractor nears the young boy, it stops and its driver and passenger disembark and walk past him. The man in the back ruffles the child’s hair as he passes. He then crouches down at a roadside ditch that is partially covered in concrete. The music stops. Aside from being an extraordinary display of cinematic technique, these opening few minutes hint at a lot of the themes that will be explored throughout the narrative. The style employed evinces a highly effective nostalgic air, which is universal but ultimately very specific to South Korea. 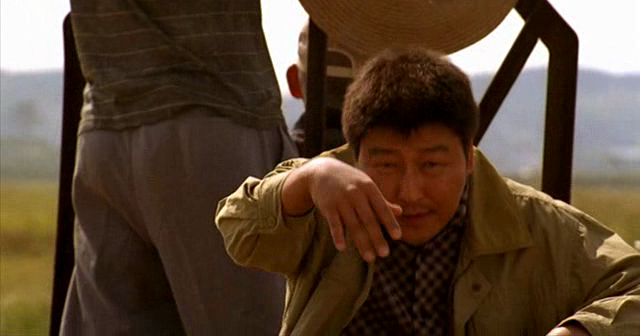 The film is set in 1986, in a troubled time of recent South Korean history. So while the music and cinematography imply a sweet reminiscence, the sight of a burnt out car, decrepit tractor and youths that seemingly do not respect their elders injects a bitter tone into what ultimately becomes a very bittersweet narrative. Aside from the tone, the location itself is foregrounded and very central to the film's ideological motives. Not only do we start in a wide open space and a wheat field but on a small dirt road that may not have a real destination. Memories is a film that is part of the new, more commercially viable trend of Korean cinema. It is of a very high production calibre and was ultimately hugely successful but its roots are clearly evident from the start as it harkens back to the New Korean Wave that manifested itself in the mid to late 1980s and probably finished with the release of Peppermint Candy (Dong) in 2000. A lot of the films in this movement were road movies that followed emasculated males that suffered from post-traumatic anxiety and wandered aimlessly and ultimately towards death or insanity. 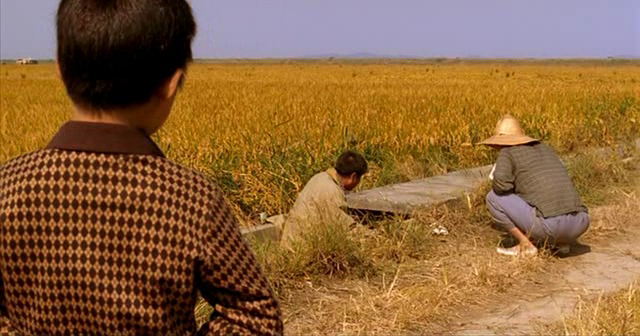 Kim in his seminal exploration of male post-trauma, The Remasculinization of Korean Cinema, states "The loss of homes or the fragmentation of families suffered by many then amplifies the meaning of the road as a site of neither transit or freedom. It is where people suffer: traumatized beyond recuperation, disenfranchised without a place to return, and the prospects of leaving behind the road unrealizable" , much of this anxiety stems from the difficult separation of the Korean peninsula but also speaks of the emasculation of males during the Korean War and other military occupations throughout the 20th century. Especially that of family men whose families were broken as wives became prostitutes for foreign soldiers and the men could do nothing but look on. In Memories, the central protagonist is Detective Park Doo-man, played by Korea's biggest star, the surprisingly normal and bumbling Song Kang-ho, who effectively took on the mantle of Park Joong-hoon, the mainstay star of the New Korean Wave. His character, like so many that he plays, is not particularly attractive. Although not wholly unmasculine, he isn't very smart and is easily moved to jealousy or ridicule. However, he is an affable character who is not completely lost and is therefore indicative of a legion of post-traumatic males, at least coming from the perspective of New Korean Cinema filmmakers. Back to the opening sequence, as we watch with the child as Park investigates the scene of what turns out to be a gruesome crime when we see a young women's naked body in an advanced state of decomposition, this is the first of many examples of visceral contrast in the film. It clearly places us in a state of discomfort that can't be shaked throughout the narrative. Within these opening minutes it is quite clear the direction that the film wishes to pursue. We are entering a time in history that would have coincided with the youth of the filmmaker and while beginning in a nostalgic tone we are quickly subjected to the horrors that allegorically represent the time. On top of this, Bong also challenges the masculine character created by New Korean Cinema, so what we have is a highly revisionist exploration of history from the male perspective of the 386 generation, which is the term for people who were born in the 60’s, went to college in the 80s and are now in their 30s (this terms can be labelled on most contemporary Korean filmmakers). 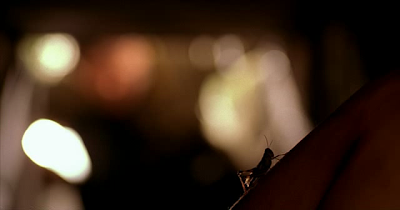 The opening scene also adds another link between these two states of nostalgia and revisionism: the opening shot has the boy snatching a cricket, a minute later we see that he is holding a jar full of crickets and just afterwards, once the mutilated body comes into focus, we see that there is a cricket on it. Not only does this contrast the two states of remembrance but it also associates death with the past as well as informing the narrative of the military dictatorship that the film’s story unfolds under. The boy can in fact represent both nostalgia and the military dictatorship, this becomes more pertinent when he is shooed off but refuses to leave. This could represent the omniscient presence of the government and its reach into everybody’s affairs. He also never says anything, save mimicking every word of detective Park: symbolic of a government which refuses to explain itself and subjugates all its civil employees. Park clearly feels unable to do anything about this mockery and lets it lie. The scene ends with him looking at the corpse and then directly at the boy. He tilts his head and squints his eyes and then the boy does the same. Park looks defeated already and is clearly terrified of the task of finding the killer which now faces him. 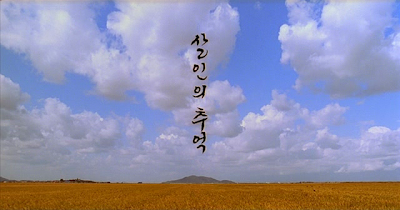 At this point the nostalgic melody comes in again and we cut to the title shot which is a perfect postcard image of the wheat field and the huge space in which it lies. As any good opening scene should, this one hints at all of the major themes that will be explored throughout the narrative and is therefore a good sounding board to start off a discussion about post-traumatic masculine identity in contemporary South Korean cinema. Since there are many small strands that need to be addressed in order to get a full picture of the representation of males and Bong’s sociological motives throughout the running time of Memories, I have broken down this essay into six short chapters followed by a more comprehensive conclusion. The first thing to look at and what has already been mentioned in the dissection of the opening scene is the loss of home and it’s impact upon a male generation in South Korea and how the principal protagonist is used to elucidate upon this phenomenon. Next I will discuss the evolution of the character of the post-traumatic male from its first notable appearances in the films of the 1980s up to its most modern incarnation in Memories. 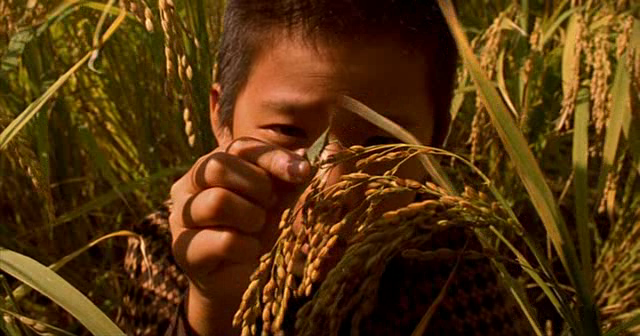 Following on from this, a look at Bong’s use, adherence to and subversion of generic staples and codes and how his approach strengthens the sociological impact of the film. Then we will look at the compromised representation of females within these male-dominated narratives and specifically whether or not they are only symbolic and cannot be seen as whole characters. In the next chapter, I will present a case for Bong’s use of psychoanalysis as a means of representing a scarred national identity within a very specific historical framework and how the films’ specific genre ultimately leads to this. Before the conclusion I will briefly examine Bong’s subsequent film The Host and determine whether or not his sociological agenda has continued into an equally important aspect of Korea’s society, namely by representing family with melodrama. Finally in the conclusion I will wrap up all of the arguments presented throughout with a detailed analysis of the closing scenes of the film which serves as an excellent bookend to the film and closing point to the essay. I watched the movie a month ago and I kept thinking that I was missing some of the motifs and allegories to society in the past/present because I lack knowledge on the history of Korea. This analysis was helpful in unveiling a lot of the historically significant ideas and concepts that your average movie watcher might have missed. When it comes expounding upon the use of film techniques to relate themes to the audience, this analysis was insightful in doing so clearly.